WenVen found themselves inspired by military uniforms and classic work wear, which became the genesis of the Field Outerwear. Ever feel like you are wearing a straight jacket when you're climbing or crawling around on the job, Most work jackets aren't designed for comfortable active wear, but our jacket is different. The cotton canvas has the free-and-easy feel of a sweatshirt and flexing adjustable storm cuffs. Inside, the soft 100% cotton lining is warm without bulk. 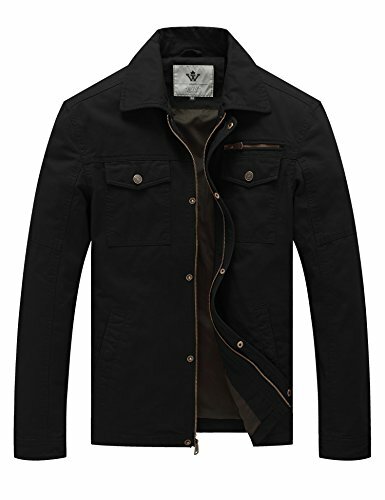 Rugged metal-toothed front zipper has interior storm flap to block howling winds. Full-length zipper enclosure as well as button enclosures for extra protection. Warm,soft lining with interior pocket. Four large pockets to meet your storage needs.Great For Casual Daily Work Wear, Safari, Sightseeing, Fishing, Camping, Traveling, Photography. Unique stitching and pocket placements provide a stylish and modern look. Machine Wash: Normal Cycle, Hang Dry. If you have any questions about this product by WenVen, contact us by completing and submitting the form below. If you are looking for a specif part number, please include it with your message.